A creamy & cheesy queso dip recipe using three types of real cheese (that's right, no processed "cheese" product), onion, garlic, poblano, jalapeno, half & half, and spices. This easy (and quick) queso is perfect as a dip for your favorite chips or poured over nachos, chimichurris, enchiladas, or sandwiches as a cheese sauce! TIP: Because making queso is such a quick process, make sure to prep and cook (if necessary) all the other ingredients first. This way there's no room for any distractions that'll allow the roux to burn, bechamel to curdle, or cheese to become clumpy/oily/stringy while you're trying to multitask in the kitchen. 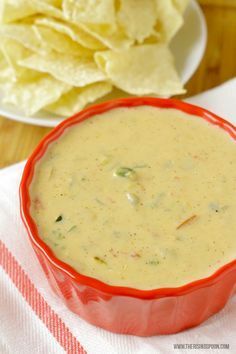 An easy homemade queso dip recipe made with three types of real cheese, onion, garlic, peppers, and spices in 30 minutes or less. Perfect for game day parties, holiday gatherings, or a relaxing night in! *Note: I urge you to buy block cheese and grate it by hand, as pre-shredded cheese is covered in anti-caking ingredients that can cause it to clump instead of melting into a smooth dip. Prep the ingredients first so you're not distracted while making the cheese dip: peel and dice the onion, dice the poblano and jalapeno pepper (after removing the stem and seeds), peel & mince the garlic, shred both the cheeses, cube the cream cheese, measure out the butter, flour (or preferred thickener), and half & half, and drain and measure out the tomatoes. Set the sea salt, cumin, chili powder, cayenne pepper, lime, and chopped green chiles to the side to add last. Add the cooking oil to a skillet set over medium heat. Follow this with the diced onion, jalapeno, and poblano. Sprinkle the veggies with a little sea salt (to taste) and cook for 10 minutes, stirring occasionally, then turn off the heat and set aside. Add the butter to a saucepan set over medium-low heat and let it melt. Slowly sprinkle in the flour a bit at a time, stirring constantly, then let the butter/flour (roux) mixture cook for about 5 minutes, or until it's lightly browned. Slowly pour in the half & half, stirring constantly (and well) to prevent clumps. Bring the mixture up to a slight simmer (you will see bubbles form around the edge of the milk), reduce the heat to LOW, then slowly add the shredded cheese about 1/4 cup at a time, stirring constantly to prevent clumps or the cheese from separating. The KEY to success here is to let each portion of cheese melt fully before adding the next amount. Once all the shredded cheese is fully incorporated and smooth, add the cream cheese in chunks and stir until fully dissolved. Gently fold in the cooked onion, peppers, garlic, diced green chiles (undrained), tomatoes (drained), cumin powder, chili powder, and cayenne pepper. Taste the mixture and add sea salt to taste, as well as more spices, if you feel necessary. Remove from heat and serve immediately with chips or your favorite dipping foods.